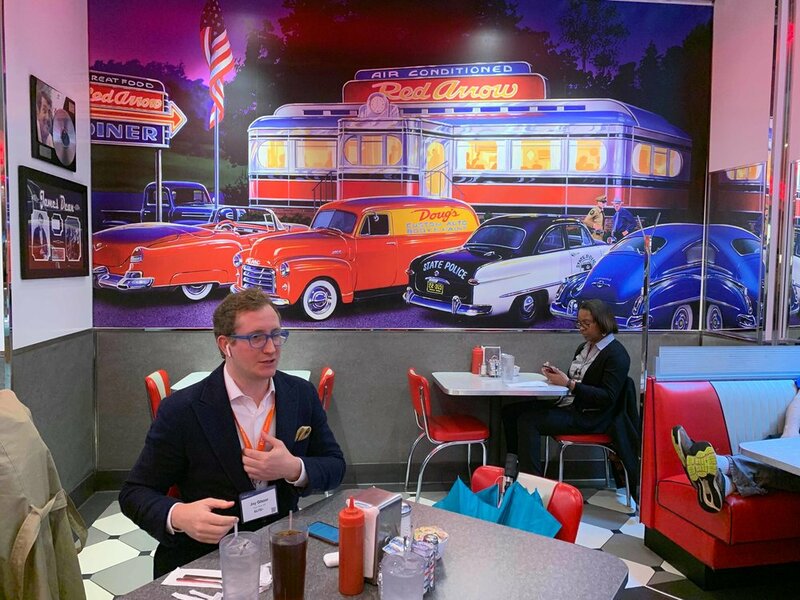 Last week we attended Tom Ferry’s Marketing Edge in Charlotte, North Carolina for a two-day event learning about the latest marketing strategies and techniques to better serve our clients. Presented by Jason Pantana, we discovered some pretty interesting new-technologies coming to market and innovative listing strategies that we’re excited to bring to the table for both our buyers and sellers moving into 2019. Given the current climate and the fact that the market has shifted considerably this year, staying ahead of the curve when it comes to market is going to be crucial in completing any successful transaction, be it as a buyer or seller. A running theme of the event was to lead with video marketing across all pillars of your business, something we strongly believe in and actively engage with on a regular, consistent basis. So, what does this mean for you, our customer? FOR OUR SELLERS: we aim to continue doing this through our creative approach to listing videos, thinking out-of-the-box to create something compelling that stands out from the typical walk-through videos. While your classic walk-through style video can look pretty, it looks just like every other real estate video out there! We try to cut through the noise and stand out from the crowd by creating a story line or narrative to really help sell the lifestyle characteristics of the home. Our hide & seek video at 303 Mercer St, B102 is a great example of this. In terms of reaching more buyers and attracting quality leads, we continue to implement best-in-class digital marketing efforts across our social media platforms through highly targeted, strategic ad placements. We also have the added ability of creating custom-built, property specific landing pages to promote your listings pre-launch as well during the active listing phase. You can view a sample landing page here. These landing pages are optimized to capture quality leads and drive traffic towards your listing. Additional marketing efforts include twice-monthly direct mail campaigns to a specific designated geographic area in which we are highly active. Diversifying our marketing efforts across a range of both digital and traditional platforms is one of the reasons we continue to have much success, even in these trying times. FOR OUR BUYERS: we’re continually looking for new ways to bring you value. One way we do this is through our weekly educational video series, #GuidancebyGlazer, where we riff off topical industry news with our unique perspective and point of view. The aim is to keep you up to date with what’s happening across NYC and provide as much valuable content as possible. This also applies for Sellers as we regularly touch on topics relating specifically to selling your home. Another fun way we try to bring value is through our lifestyle series, ‘The One Triple Zero Three’ which is still in production mode with new episodes coming soon! Jay on stage with Jason Pantana, Carl Hawthorne and Jasmin Bradley. Live streaming as always! If you haven’t already, join us on Facebook for more great content like this! A packed crowd on Day 2 of the Marketing Edge conference. Not a free seat in the room! A particular highlight of the conference was on Day 2 when Jay joined Jason up onstage for an interview to discuss some of our teams challenges, opportunities and things he wish he knew when he was starting out. Jay was joined by Carl Hawthorne of Canton, Georgia and Jasmin Bradley of Keller Williams Augusta, Georgia. You can watch the full panel interview here. 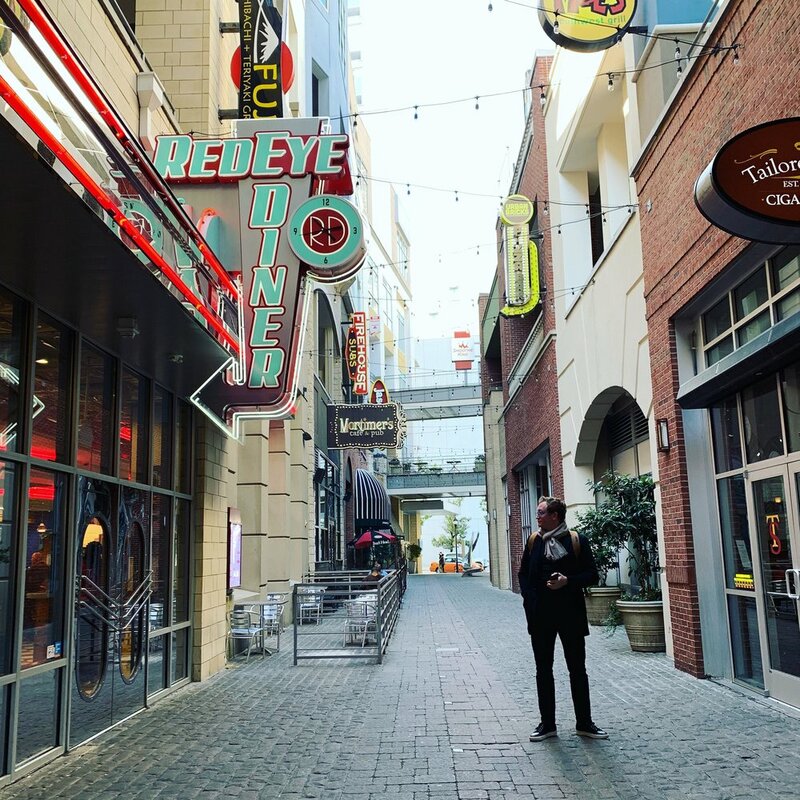 Apart from the conference itself, it was a fun few days visiting Charlotte (albeit at a very cold time of year), scooting around town on our birds and limes and visiting some local spots. 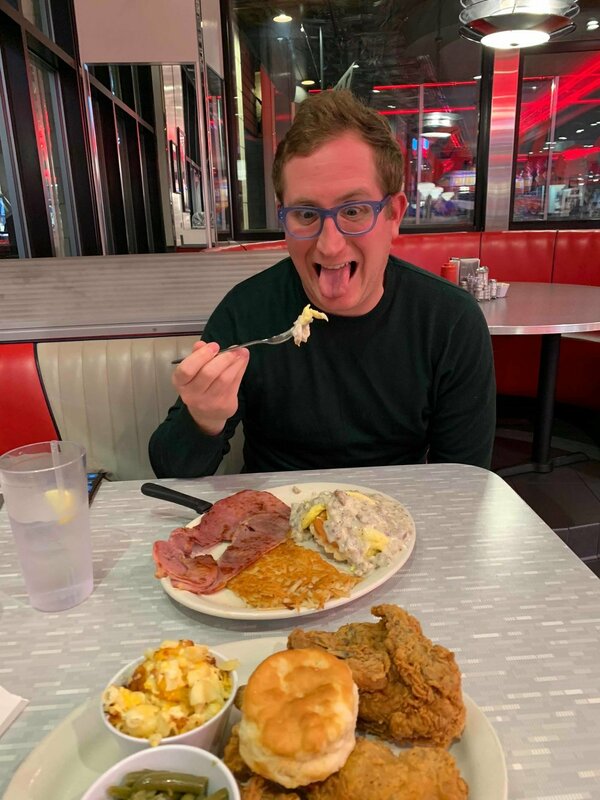 Jay found himself right at home at the local cigar lounge, ‘Charlotte Cigar Club’ and we may have found our favorite locale for next time we visit, the Red Eye Diner, where we ate three times over two days, getting our daily dose of southern comfort classics. We may have put on 10lbs each, but it was totally worth it. 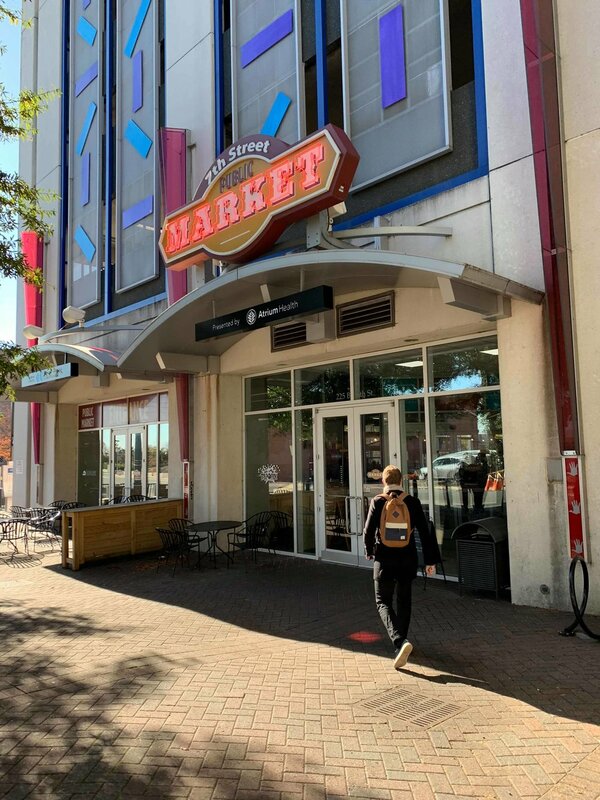 The 7th Street Public Market is full of great breakfast options! Still working, even in the cigar lounge! All up, a fun trip with plenty of exciting marketing strategies we look forward to implementing in the coming months. Here’s to crushing 2019!